This article was originally emailed as our monthly eBulletin at 11:30 on 13/05/2015. You can view older eBulletins here and register to receive them monthly. This is now a significant event in the calendar of workplace design and furniture. 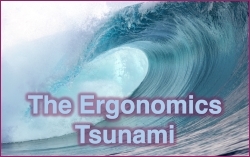 For those taking part, ergonomics is an essential subject for some, a relevant topic for others and a misunderstood and inconsequential distraction for the rest! What CDW does provide is an opportunity to experience current and future thinking about the workplace and its populations through a combination of displays, presentations and installations. It is primarily a manufacturers’ event so we attend as visitors. We hope to bump into you there! Recently, we have been discussing Millennials with Orangebox, Human Applications and Cardinus There are major issues arising from the behaviours, beliefs and attitudes of young people now entering the workplace, especially in the context of their long-term use of technology. Our recent webinar, targeted primarily for the North American market, is now available as a video. This will also be the topic for our June webinar series. I have been visiting this exhibition in Germany for many years. 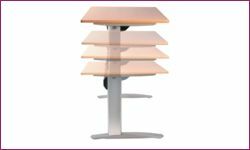 It targets manufacturers and most exhibitors supply machines or components for the furniture industry. If you want to choose a new set of kitchen drawer handles from a choice of 10,000 variations, this is the place to visit! More significantly, there were some really interesting demonstrations of how 3D printing technology is already starting to impact furniture design and manufacture. As discussions rumble on about excessive sedentary behaviour, there is a growing understanding that the essential message is to sit less rather than stand more. Our recent webinars were well received and provided a mix of historical context, current perceptions and suggested actions. A recording is available here or you can access more information from my blog. I am delighted to confirm that we are now receiving a slow but steady flow of stock. Full production is still a few weeks away but our first orders have now been fulfilled. If you have not yet seen Bakker Elkhuizen’s brilliant solution to excessive tablet use, you can see the video here or contact us to arrange a demonstration. You are currently browsing the Guy Osmond blog archives for May, 2015.